Observation spacecraft placed in orbit around the Earth. It orbits at an altitude of about 400 km. Luminous phenomenon that occurs at high altitudes near the Earth’s poles. Luminous trace produced when a meteorite burns up as it enters the Earth’s atmosphere. Commercial aircraft that makes regular flights of variable duration, depending on the distance covered; it flies at altitudes of 12,000 meters. Layer of gas that absorbs a large part of the Sun’s ultraviolet rays. The world’s highest peak rises to an elevation of 8,846 meters. Aircraft whose cruising speed is faster than the speed of sound; it flies at altitudes of 19,000 meters. Fine droplets of water or ice crystals suspended in the atmosphere. The most dense layer, which produces most of the meteorological phenomena and where temperatures decrease with altitude. Highly stable layer of air where temperatures increase with altitude due to the absorption of solar radiation by the ozone layer. 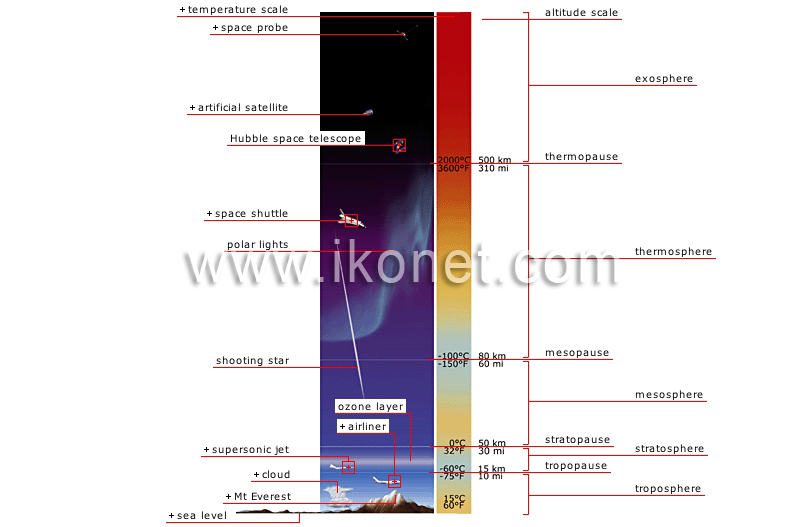 The boundary between the troposphere and the stratosphere; its altitude varies depending on the season, ground temperature, latitude and atmospheric pressure. Thin transition layer between the stratosphere and the mesosphere. The atmosphere’s coldest layer, where temperatures decrease with altitude. Thin transition layer between the mesosphere and the thermosphere. Layer that absorbs a large portion of solar radiation, leading to a steady increase in its temperature. Thin transition layer between the thermosphere and the exosphere. The outermost region of the atmosphere, where low-density gases disperse into space.